Nearly everyone can benefit from having a fireproof safe at home. Fireproof safes are the perfect place to keep important documents like passports, car titles, tax records, wills or other legal papers, and insurance policies. But what exactly are you getting when you purchase a fire safe? It’s important to keep in mind that although “fireproof” is a commonly used term, safes can really only be fire resistant. The degree of fire resistance varies widely, however, so it’s best to look for a fire rating tag by Underwriters Laboratories. Labels that indicate “factory tests” or “factory fire ratings” are usually biased and misleading. There is a big difference between a standard fire safe, and a fire & burglary safe. A typical “fireproof safe” is one you might find at a box store. These safes are geared toward protection against fire, but only for fire. Many of these products are UL rated for one hour. But that fire rating can be accomplished with a paper thin steel exterior and a plastic interior. Some even have plastic on the exterior as well as the interior. Many low end fire safes have very cheap plastic locks that are easily broken. Typically they will also have locking bolts that are small and few in number. These bolts may be pot metal rather than steel. 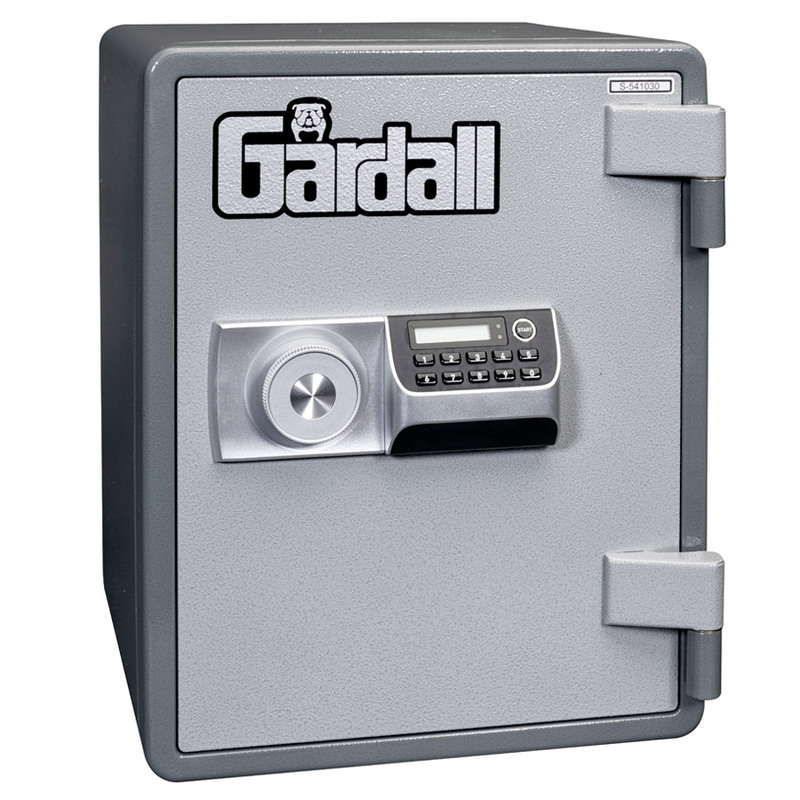 We recommend Gardall Safe’s Microwave fire safes which cost slightly more than a box store unit. You get moderate burglary resistance in addition to a one hour fire rating. The outside has thicker steel, the inside is steel rather than plastic, the lock bolts are steel and these safes are pre-drilled for anchoring them to the floor. For a higher level of protection we recommend Gardall’s American Made Two-hour BF. It obviously gives better fire protection. In addition has U.L.’s RSC security rating which is achieved with more steel, bigger bolts, a better lock, etc. 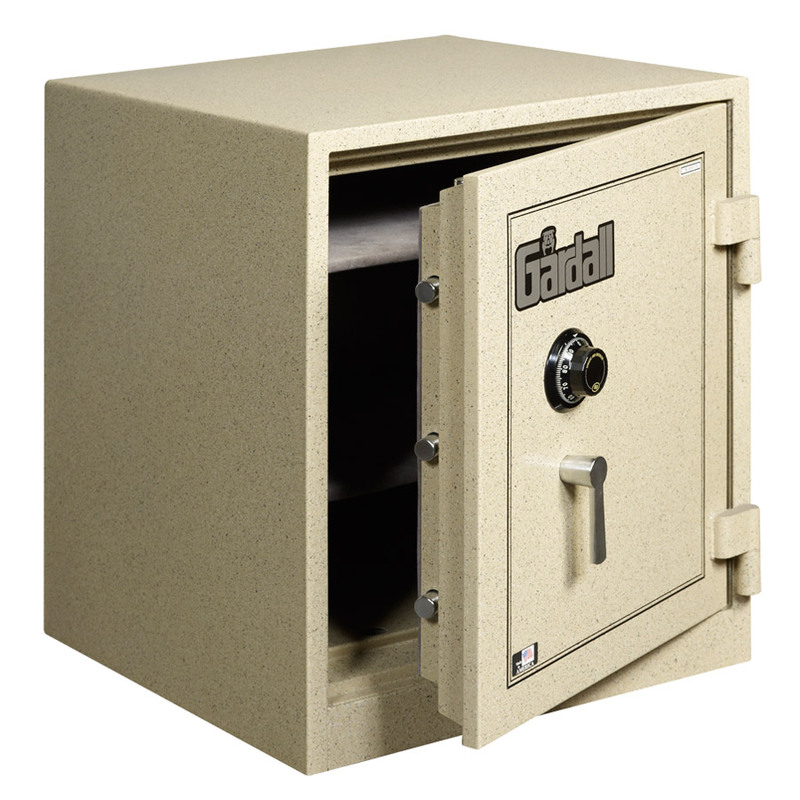 No one makes Four-hour fire rated safes anymore, but we usually have one or two used units at our store. Higher end “drop tested” fire safes offer more protection, assuring that even if the safe falls through one or two floors of a burning house it will remain securely intact. A drop-tested safe will also offer more burglary deterrence. Fire & burglary safes are intended to keep burglars from breaking in, in addition to providing fire protection. To enable the safe to stand up to drills, cutting tools, and prying tools the steel is typically heavier – 11 gauge, 10 gauge or 3/16 are common. Lock bolts will be large and made of solid steel. The composite material is likely more dense, too, to make drilling more difficult and to resist sledge hammers better. There may be a trade-off, however, in that the denser composite is not as fire resistant as the lighter material. So while you get better burglary deterrence, you may get a little less fire protection. Fireproof file cabinets might actually be your best option, rather than a safe, if you need to store a large volume of important, well organized documents. Just like a regular file cabinet, a “fire file” allows you to maintain papers in a very organized way, but you get the bonus of U.L. fire ratings. Fireproof file cabinets are not as burglary resistant as a good safe, however, so think through your requirements. We usually have an inventory of good used fire files to save you money. Media / data safes are the very best options for protecting historical documents, stamps, cd’s, jump drives, tapes, etc. In the earlier days of computers, before off-site back-up became common, a different kind of fire protection was needed. Tapes and discs could be ruined at temperatures as low as 175 degrees and humidity levels of 90%. Safes made for protecting media were very expensive, and their special type of construction makes them larger than traditional fire safes. Now seldom used, fireproof media and data safes are available at great second-hand prices. During fires media safes keep the internal safe temps much lower than standard units, and they keep the inside air drier. High quality gun safes can also provide excellent fire protection. It is important to deal only with an experienced safe company, because so many gun safes have deceptive fire ratings. The fit of the door, the number and type of door seals, the type of insulation and several other factors are critical to the effectiveness of gun safes. We are committed to help you find the right fireproof safe for your specific needs. Stop in to Hoogerhyde Safe & Lock in Grand Rapids to find what you are looking for. Our professionals are always available to help you select the right product.